I wanted to try out a wood stain so I stained a couple of coffin-shaped trinket boxes. I really liked how rich and aged it made the wood look. 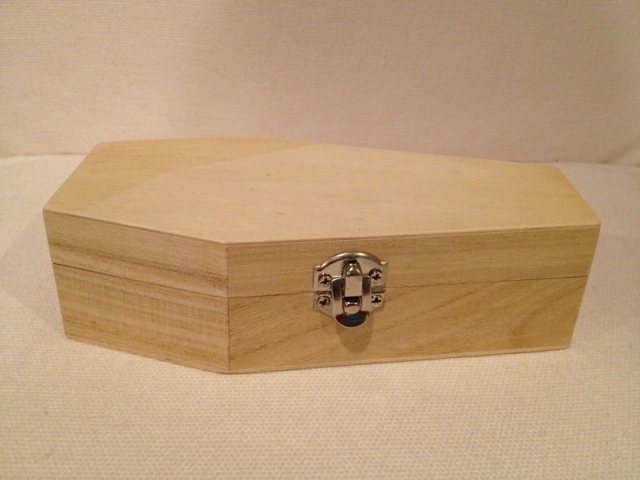 Before I stained it, the coffin looked like this, just plain light-colored wood. Start with a trinket box and sand it down before you do anything else. 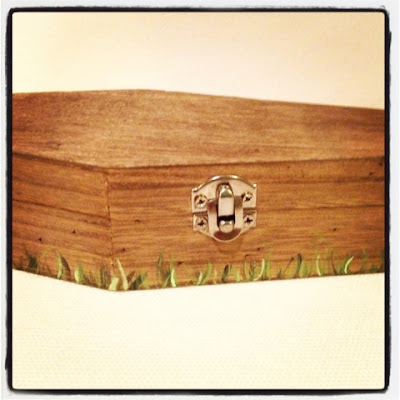 The next step for this coffin was distressing the wood. I took a hammer, chain, and screwdrivers and gave it a good beating. It's good to do this before staining the wood, then you can get the stain down in those distress marks to darken them up. If you distress it after you stain the wood, you could end up with light wood showing through, and that ruins the effect of the stain. I rubbed wood stain into the box both inside and out. Watch your fingers when staining! The oil from your hands can mess with the finish. If you have some latex gloves, wear them. The coffin box was still quite plain after all the distressing and staining. I loved the look but it needed an artist's touch. 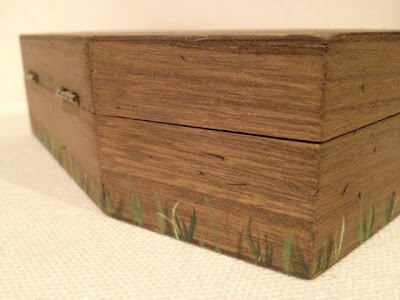 So I used a fine-tip brush to hand-paint grass all around the base of the coffin. Paint grass in clumps!Think crab grass. Natural grass can be varying in height and density of ground coverage. Vary the lengths of the grass, and let the blades bend in different directions and cross each other. The top of the grass should taper to a point. Practice your paint strokes, lightly using the tip of a fine-tipped brush.